The analysis of state failure and state collapse has gained widespread academic interest over the last years and combines various academic disciplines related to the reasons of non-functioning states and the variables which lead to state failure. This essay will try to contribute to the actual debate by examining to what extent patterns of political behavior can be used to explain state failure within developing states and, more particular, state collapse in Somalia. Therefore, this essay will first discuss theoretical approaches trying to explain state failure and the differences between state failure and state collapse. I will argue that the complexity of state failure and state collapse leads to an ongoing debate about the nature and perception of these states which is often misleading. Whereas the dominant factors which cause state failure are often found in bad governance and bad leadership, other factors such as the role of external patterns of political behavior during colonial times as well as during the cold war fostered weak state structures and enabled African rulers to develop a different understanding of the state as a tool for personal ends that lead to a logic of self-destructive despotism prior to state collapse. In a second step the article examines the case of Somalia in further detail, trying to analyze causes of state collapse and the impact of political behavior that led to state failure within the Somali context. I will argue that on the one hand patterns of political behavior by foreign actors are one main cause of Somali state collapse. On the other hand, the rule of Siyaad Barre and his patterns of political behavior followed a logic of self-destructive despotism which contributed largely to the fact that Somalia collapsed in 1991, when Barre was ousted. 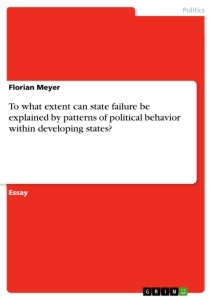 Finally, I will draw a conclusion based on the presented analysis to what extent patterns of political behavior within development states can explain state failure. Doornbos identifies six different patterns of state failure and state collapse. First, states like Zaire under Mobutu or Uganda under Amin, where the privatization of state assets by the state rulers, so called cleptocrats, have become extreme and lead to uprising movements like militias or liberation forces that challenge the current system. Second, States like Chad or Rwanda with a historical mismatch between the nature of existing state institutions and the socio-political processes within the affected societies. Third, states where ongoing conflict is fuelled by the struggle over the control of natural resources like diamonds or oil, involving a variety of actors undermining state control. Fourth, states where conflict is centered on the overall political and cultural orientation of the state like in Afghanistan or Cambodia. Fifth, states facing secessionist movements challenging the legitimacy of existing state frameworks. Sixth, fragile states which face severe economic breakdown which affects the livelihood of large proportions of the population and finally can lead to state collapse. (Doornbos 2008: 258) Doornbos attempt to categorize different patterns of state failure and state collapse illustrates the complexity of the subject pointing out the intertwined character of weak state institutions, authoritarian rule, bad governance, internal competition for resources and cultural, ethnic or religious tensions within society amongst other variables leading to state failure. In most cases, countries can face multiple of the above mentioned challenges, thus leading to a more complex situation, which has to be examined closely in each individual case and makes generalization nearly impossible. However, there is a growing group of scholars challenging the failed state discourse itself and its underlying assumptions. Jones 2008 argues that the failed state discourse can be seen as a mean for imperial intervention of the west in fragile states that is legitimized by the assumption of inferiority and incapacity compared to the western model and the context of the current War on Terror. Furthermore he argues that the conditions in most so called fragile or failed states can be rooted back to colonial and postcolonial rule, especially during the Cold War, where western powers intervened based on geo-political logics, often backing authoritarian rule and undermining previously existent democratic procedures. Thus, following Jones, the current situation in most fragile states is not based on an inherent lack within these societies, but has been the result of western policies over the last centuries. This radical assumption points to the fact that the failed state is a product of western politics and therefore externally caused. Although I agree to some extent with his analysis, he neglects the necessity of local leaders cooperating with external forces. Most cases of failed states cannot be explained without taking a closer look at the political behavior of ruling elites within developing countries. With Batons and Vuvuzelas. To What Extent Can South Africa’s Safety and Security Policy for the 2010 FIFA World Cup Make a Sustainable Contribution to International Tourism to the Country? Can There Be a Universal Definition of Poverty? To What Extent can Integration be Achieved in France and Britain?